The iPhone 4S is a clever piece of technology. When surfing the web on the smartphone, you can open both pages for web and pages for mobile phones, allowing the user to access more websites than a normal mobile phone user. The apps and app store make it easy for the audience to travel through their phone and use applications that are relevant to whatever they want to use their iPhone for. With such a demand for the latest model of the Apple iPhone, it’s certainly not surprising that the features on this phone are endless. Social networking applications, email feature, Siri, iTunes music library and the iTunes store, games, magazine apps… the list goes on; and that is why the iPhone is a great and prominent media product today. Battery life is what lets this down most of all. Hardly lasting through the day, you have to take your iPhone charger with you everywhere to stand a chance of keeping in contact with the world. Because of the iPhone 4S having a rather large downfall, overall it gets a 4.5/5 star rating. The BlackBerry; it has many problems, the biggest being you cannot open a large webpage on the handset without it crashing and having to close down the Internet page. Although the social networking applications, like that on the iPhone, are very simple to use and easy to open, the good features on this phone do not outweigh the bad. The camera, video and sound recording features are not very good and compared to other phone features the quality is terrible. The battery does last longer than that of the iPhone’s, but still doesn’t last longer than a day and a half. Overall, the BlackBerry gets a rating of 2.5/5. Mac’s greatest feature is the ease of use given to the user by the control panel at the bottom of the home screen; it is slick and stylish, which is a good feature to have to be able to appeal to an audience who desire the best looking piece of technology on the market. The Mac gets a 3.5/5 rating. I find the regular PC laptop much easier to use than that of a Mac. A PC is much easier to control via touch scroll mouse than it is to use the mouse for the Apple Mac. Although you have to click a few more buttons to find a document you’re looking for or to select PowerPoint from your software, the product is much easier to get used to and much simpler to navigate yourself around. In conclusion, comparing the Apple Mac and your ordinary PC, I think the reliable PC wins out in my books. The PC laptop gets a good 4.0/5 rating. The Kindle is a great product for people who love to read books but don’t necessarily want to carry around hundreds of books with them. The Kindle book store is a suitable space to hold all of the Kindle owners books, there they can choose which book they want to read when they are out and about. 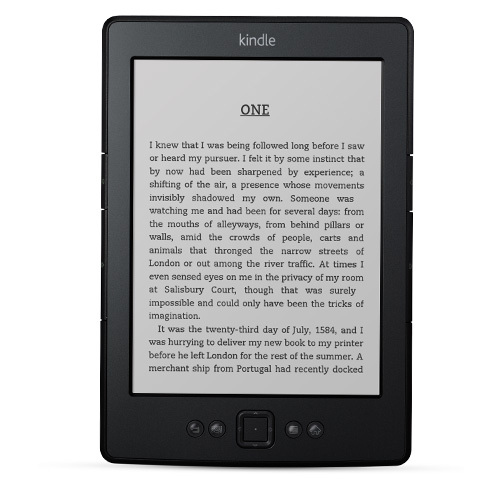 The online feature allows the user to buy books from the Kindle store which are then downloaded into their personal book library which the user can open straight to when they turn on their Kindle. Battery life is also very good on the Kindle; with power lasting into the months depending how often the audience uses the item. Overall, I find this piece of technology very effective for a wide audience, however, if people like reading actual books, the thought of a using Kindle can be horrifying. The Kindle gets a 4.0/5 star rating. In the past decade online articles and sites have been increasingly popular due to the technology boom. Newspapers are now not as popular because of this. The main question is though: will the rise in online publishing affect the sales of printed journalism? The Guardian, a print tabloid, covers both online and printed journalism, much like many other newspapers. In the years 1994-95 the paper began development for an online version of the publication, when the paper wanted to expand their readership and be accessible during the development of technology and the growth of the Internet. Guardian Unlimited had over 2.4 million online users by 2001, according to figures carried out by The Guardian itself. The online Guardian Unlimited network of websites became a unified whole which started in the January of 1999. The Guardian online is the second most popular newspaper website in Britain, coming in behind the Daily Mail’s, Mail Online. Its printed form has an average circulation figure of over 215,000 papers being sold, after The Times’ and The Daily Telegraph’s 400,000 and 634,000 sales, respectively. The Guardian’s online browser numbers are in the millions, with nearly 3 million hits on the website daily, which shows the growth of the online audience to their minute number of paper-form readers which pales in comparison. According to MediaWeek figures, http://www.guardian.co.uk is the fifth most popular newspaper site in the world (April 2011 statistics). The New York Times came in first, above the MailOnline in second place, Huffington Post third, Tribune Newspapers in forth place, and The Guardian rounding off the top five. Now that computers, technology and Internet are part of our everyday lives, and the use of Internet on gadgets such as mobile phones, iPhones, iPads, tablets, laptops, Kindles and so on, reading up on current affairs is much simpler to do using the newspapers website, a big part of that being that it is the free way of getting information. As The Guardian is a daily newspaper, if somebody does not catch a certain story that would spark their interest to read from a past Guardian paper, they can search for the story online and read it there, this is a feature of online websites compared with printed newspapers. Another giant factor of the website being more popular than reading in newspaper form is the ease of use of the online applications. The Guardian has a digital edition of the daily newspapers that are published in print, which is available to the user when they subscribe to http://www.guardian.co.uk. The website has a mobile phone format so that it can be opened from a mobile, this makes it more accessible to people on the go. This simplicity attracts a wider market than The Guardian’s printed paper audience. However, lots of people still prefer holding a printed version of a newspaper in their hands, as they are able to read a story and, if they find it particularly fascinating, go back and read it again. This is easier to do when The Guardian is printed as a newspaper. This could also be a case of personal choice and familiarity to an audience. If the reader is of a certain age where technology does not appeal to them, they would buy the newspaper version. With The Guardian being more popular on the web means that the newspaper has much more of an audience on the Internet than of people buying the papers at the news stands. Journalists are hired to write for the paper just for Internet articles, the website needs to be much more up-to-date with information than the printed papers. As a result, focus will be kept mostly on the writing on the online articles being written. The online articles can also be updated more easily and instantly whereas if the print readers want more information on a subject they would have to wait until the next Guardian has been published, which would be the next day. This newspaper was founded in Manchester, originally named The Manchester Guardian, by John Edward Taylor, with the first publication going on sale on May 5th, 1821; it was formerly a weekly issued newspaper until 1836, ultimately changing to a Saturday and Wednesday paper because of the reduction in Stamp Duty on newspapers. In 1855 the paper changed again to a daily newspaper, also because of the decrease of the Stamp Duty tax rate. Being the United Kingdom’s first full colour national newspaper was as ground-breaking for The Guardian as being the first newspaper to assume a mid-sized print format, adopting it from the Berliner Guardian in 2005. In 2008 the online website for The Guardian became http://www.guardian.co.uk. With their website having the subscription option and applications for the iPad, iPhone, and Kindle, The Guardian’s online world is growing exponentially. Today, The Guardian has many Twitter accounts dedicated to the vast topics of news in current economy, society, environment, media, politics, and so on. Posting on social networking sites means that the paper can reach many different audiences and can spread their market to online users as well. The online audience of The Guardian can access the information much quicker and easier than the printed version readers. Due to the increasing rise of technology importance in our everyday lives, more and more people are using the resources on the Internet as a form of gathering the information that they want to read instead of making the effort of buy the newspapers and getting the data in printed form. The Guardian. (2012). The Guardian. Available: http://www.guardian.co.uk/. Last accessed 13th Nov 2012. Guardian. (2011). History of the Guardian. Available: http://www.guardian.co.uk/gnm-archive/2002/jun/06/1. Last accessed 1st Nov 2012. Arif Durrani. (2011). MailOnline overtakes Huffington Post to become world’s no 2. Available: http://www.mediaweek.co.uk/news/1066247/MailOnline-overtakes-Huffington-Post-become-worlds-no-2/. Last accessed 6th Nov 2012. Guardian Media Group PLC. (2010). Interactive Timeline. Available: http://www.gmgplc.co.uk/the-scott-trust/history/interactive-timeline/. Last accessed 13th Nov 2012. Twitter. (2012). Twitter. Available: https://twitter.com/search/users/guardian. Last accessed 13th Nov 2012. An aggregate is a collection of materials gathered to create a total quantity. An aggregator is a website/computer software that aggregates a specific type of information from multiple online sources. Examples of aggregators are Google, Ask Jeeves, Bing, Yahoo, and so on. A pro to an aggregator is all information for a certain topic is listed so that the user can research and find information more easily. On an aggregation website, the user can enter in the keywords at the top of the page in the search bar and all relevant information will show up for easy exploring and investigating. A con of aggregation website is not all the articles, web search results are of reliable sources. This could affect the users research as some of the information they gather might not be true. What are your first thoughts when you open up someone’s blog and have a good look around? The first blog that shall be discussed is Jon Snow’s, who is a well-known newsreader for Channel 4 in the United Kingdom. His blog is extremely clean, easy to use, and very, very basic – but this does not necessarily equal boring. Snow’s blog posts come up in a list on the main page of the blog, with the most recent entry at the top. The style is very minimalist, it has clear navigation across the blog which links to Jon Snow’s official page on the Channel 4 website, which then shows Snow’s Twitter updates and information about himself, much like a biography. The content of the blog is very much linked with current affairs across the globe, related to news topics that would be covered by Snow on the Channel 4 7PM news show. The blog details events happening in Jon Snow’s life, for example, his most recent post links the situation in Syria to an interview he did with Kofi Annan about his book which then links in with stories in the news today. Initially, the blog looks much like any other, with a simple typeface, a white background, yet colourful links to past blog posts and information about what the blogger is taking part in currently. The blog is very usable, it has links to different areas of the blog, and buttons which can take the user to Westbrook’s Twitter account, his online journal, eBooks and so on. The intended audience can also subscribe to the blog for updates when the blog is updated with new posts, this is a good feature to have on the blog so that the people who are interested in the blog posts can be notified whenever a new piece of information is added. The content of the blog is very field specific, most of the posts relate to design, web, animation, and media journalism. The target audience is much more particular than that of Jon Snow’s. Although Snow’s blog would mostly be aimed at people aged between 28 and 70, Westbrook’s market is even more definitive; only people in the business of journalism, or people who have an interest in the area would be attracted to read this blog. Wannabe Hacks is much more interactive than Adam Westbrook’s and Jon Snow’s blogs. This blog is much more like an ordinary website with a specific focus on journalism an the surrounding topics that link into that field. The audience can register and sign up to the blog to be granted access to exclusive information and content than the viewers who browse the site. The blog is set up in columns rather than lists like the others. This could be a way to appeal to the audience as to not give to much information as they do not want to overload on the written word. This leads to the use of advertisements and a moving banner at the top and bottom of the page; the inclusion of moving images and images with colour breaks down the information shown on the page and keeps the viewers much more engaged. Nine year-old Martha Payne, now a famous food blogger who has received over 1 million hits on her page, first came to people’s attention when celebrity chef, Jamie Oliver, tweeted about her on his Twitter account, calling Payne’s blog “inspirational.” The schoolgirl’s blogging achievement then sparked her involvement in charity work for the less fortunate children in Africa. The success of Martha’s blog prompted the creation of her book, ‘NeverSeconds: The Incredible Story of Martha Payne,’ with the proceeds going to the charity, Mary’s Meals. The organisation funds the building of kitchens in Malawi helping the poorer villagers who reside there acquire food and sustenance from the aid. Constructing these kitchens for the underprivileged children gives them a place where they can have a proper meal.